Vietnam offers more than golden sand beaches and blooming rice paddy fields. We have many well-known cities that are bustling metropolises. Sapa is one of the most popular destinations in Vietnam country as many stunning views, diverse culture and various traditional foods. Sapa is located in the northeast of Hanoi about 320 kilometers; this is where you can truly experience Vietnam. There are many options for you like a motorbike, minibus, sleeper bus, private car, train to get to Sapa from Hanoi. One of the most popular transportations is the overnight bus as many advantages through three categories: ease of booking, interior comfort, and expected experiences. A great news for traveller who loves to adventure Northwest Vietnam with a limited time given. The Highway Ha Noi – Lao Cai with total length of 265 kilometers giving a good solution for tourists. The trip starts from Hanoi and ends in Sapa with totally 8 hours driving by overnight bus. The highlight of the trip is the beautiful landscape along the road that you can see by day in the northwest mountains area. In this article, we offer the useful information about Hanoi Sapa Bus schedule for travelers. Nowadays, many visitors choose overnight bus to transfer from Hanoi to Sapa as it is more comfortable and safer than a bus or motorbike. Not only that it is a lot cheaper than hiring a car. Sapa can also be reached by bus which is faster but it is less comfortable and less safe — although there have been no reported serious accidents on that particular route if you can’t get booked on the train or want an option with cheaper price. There are two options for you: by sleeper bus or express Hanoi to Sapa bus. By sleeper bus, it takes you 6 hours to go directly to Sapa town. 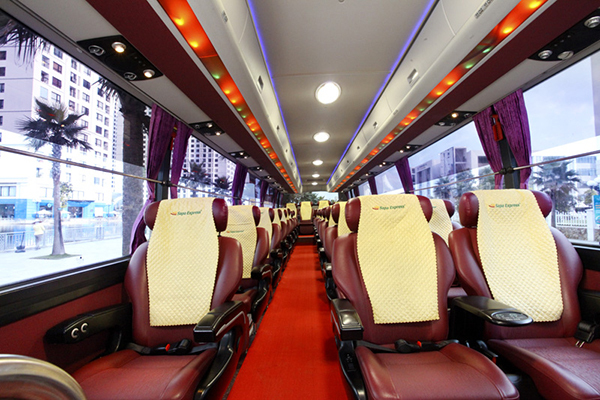 The price of tickets ranges from 10$ to 20$ one way which depends on the services of the bus like wifi, outlets, water and snacks, toilet,… You will have a smooth ride with quality buses. Many websites will mislead you by saying the ride takes only 5.5 hours but in fact, it should be from 6 to 6.5 hours, due to traffic and weather. Sometimes, the bus will drive a circle around Hanoi about one hour to get more passengers before transferring to Sapa. You might get cramped with too many passengers. The day trips should be safe, smooth, and they offer great sightseeing. If you choose the overnight bus from Hanoi to Sapa because of many useful. Firstly, you will save time through a night sleep in order to approach Sapa town. Secondly, you can satisfy the night atmosphere and enjoy the stunning scenery through the window. There are many bus options gotten the high recommendation from tourists including followed by Queen Cafe VIP Open Bus, EcoSapa Limousine, and Ha Son Hai Van. You can check their schedules, amenities and prices in our other article. Starting the overnight bus from Hanoi to Sapa tour with Cat Cat village which is located near the bottom of the deep valley right at the foot of Fansipan Peak. You will catch up in the old village in a beautiful valley about three kilometers from Sapa Town. The ethnic village attracts tourists from all by its distinctive customs and practices. This is a village of Black H’mong people where you can discover many interesting facts about their daily life as well as culture and architecture. Next, coming here you can buy several traditional handicrafts right from the craftsmen such as twisting flax and weaving fabric. Coming to this village, you will see traditional clothing being made, hemp being dyed and women weaving. A further benefit of visiting the Cat Cat Village is the ability to use the road as an interesting and easy path for trekking. This village is only about a 25 to 30-minute walk from the center of Sapa, and the relaxed hike through the mountains will give the traveler an opportunity to gaze at the water buffaloes, waterfall, and rice paddies. Nearly to Cat Cat village, Shin Chai is a special village. The Red Dao ethnic people live there. You can wear their clothes once a time in order to take the photo as they are very beautiful with distinctive silver jeweler and red turban. Coming to Shin Chai village, visitors can experience cultural beauty. If you want to more trek, Shin Chai is the next stop place. In this village, local people almost spend the time on the textile weaving and dying. You will be guided on how to produce the goods and be explained the names and function of the local flora. There will be a chance to approach the village community, clearly a traditional sporting activity and tree planting. But before catching up Shin Chai Village, you must cross 2 kilometers from Sapa Town let and on the way to Shin Chai Village, to learn about the life of Black Hmong people. 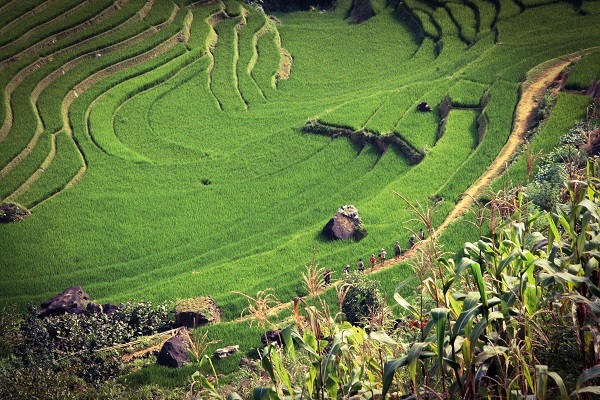 Muong Hoa is known as the largest farmland for rice growing in Sapa. Not only that Muong Hoa valley is one of the most famous places for breathtaking scenery. This valley is located on two lines of the mountain. It is far from town about 14 kilometers. Passing Muong Hoa river, you can approach Muong Hoa Valley. On the way, you can learn more about how is the rice cultivating. Muong Hoa valley is known as a valley having various colorful flowers in a wide range of beauties. From afar, you can grace the streams downhill to the floor forming the Muong Hoa. 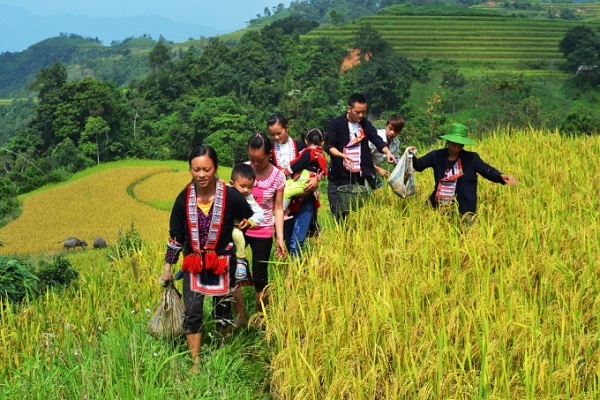 Continuously, you cross the small town and rice fields of the ethnic minority people of H’Mong, Dao, and so on. They have been working on the sloping land and living their own ways for hundreds of years. Visiting Ta Phin is one of the most popular activities in what to do in Sapa for 2 days. Firstly, to approach Ta Phin village, you must to the terraced rice fields. This village is located in the Northeast of Sapa and bordered by mountain slopes with the rice terrace fields. Red Dao and Black Hmong are two main ethnic groups live in Ta Phin village. Therefore, you will have a chance to know the unmixed cultural life of Black Hmong and Red Dzao minorities. Especially, you will know how to make the distinctively handmade brocades by ethnic people. All of the products include a bag, purse, skirt, even backpack, coat and so on will be made bright colors. You continue walking cross a bamboo forest to Giang Ta Chai., which is home to a Red Dao ethnic minority village. Giang Ta Chai is known as a home of H’mong local people then you can know how they make their clothing. They typically weave and embroider the fabric themselves. You have a chance to buy the souvenirs from them such as crafts, embroidery. You will grace a superb view of mountain and rice paddy fields of Muong Hoa Valley. Muong Hoa valley is famous for lots of colorful flowers. Therefore, you can have a chance to admire the beautiful views. You will start climbing uphill on a road. You continue driving back down to the Golden Stream and the Love Waterfall. Actually, Love Waterfall is the ideal place for relaxation because you have a chance to explore a legendary love story that has been told to generations in this land as well. If you stand from afar, the waterfall looks like a twinkling pyramid under the sun. Silver fall owns stunning views of surrounding mountains and lush forests. When you stroll on the road through the forest, you will grace the beauty of flowers with the various colors, which creates the particular scenery here. If you want to learn the culture of a region, let’s come to one of the markets in there. Especially, you can take a mini bus from Sapa bus station. 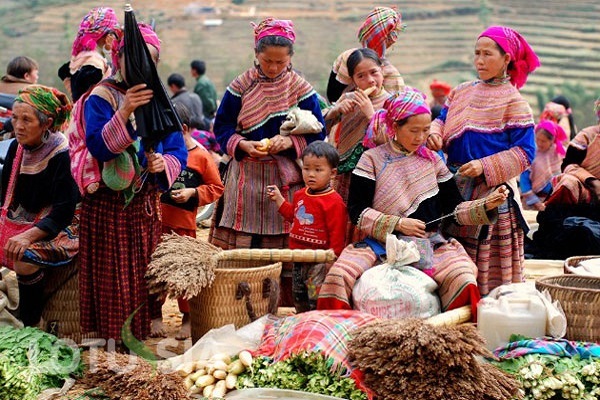 The sapa market brings the original culture of highland periodic market sessions still remain the same. Dao, H’mong people and so on will bring many home-made items brought to the market to exchange for other items or to sell for money. On the weekend, Sapa Market is more crowded as it is the right time for people from all remote villages to gather in one place. This market is the place where happens the business exchange, even make friends. It’s a cultural highlight that people love and hope to maintain.